Dymo printers are not compatible with Chromebooks. In Keychain Access, click System. 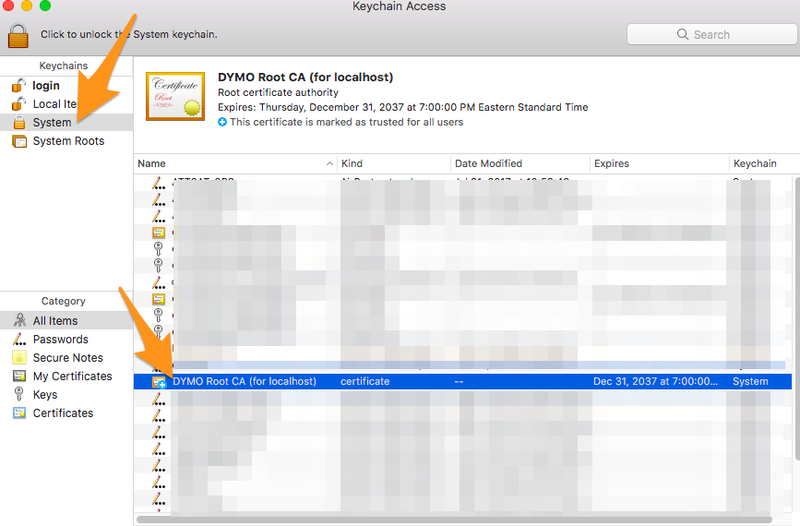 Look for the DYMO Root CA (for localhost) certificate and click it. Right click and choose 'Delete DYMO Root CA (for localhost). You will need to enter your password twice. Do this for each DYMO Root CA certificate in this area. Is in your computer's system tray (Below are instructions for Windows, followed by instructions for Mac). If you do see this message, continue with the steps that follow the Mac section. You should see the following message once the page opens.